Home Blog What is the Green New Deal? Posted February 8, 2019 by JoEllen Schilke & filed under Agriculture, Alternative Fuels/Energy Conservation, Economy, Environment, National Government, National Politics, News and Public Affairs. The Green New Deal is the Progressive Green Dream. What exactly does it address? While few would argue with the worthiness of the goals, the way they are achieved is already getting a reaction in DC. These components will be addressed as a ten year national mobilization, with the elements of addressing climate change harnessed to also address income inequality, health care, transportation, and other progressive issues. It’s authors and sponsors liken it to the original New Deal, framing climate crisis and income inequality as issues deeply damaging to the US and the world. The original New Deal, instituted in 1933 by Franklin Roosevelt, was a massive undertaking aimed at bring jobs, money, and savings back to ordinary Americans. It morphed and changed over the rest of the decade, and many of its programs underpin modern society (Social Security, Glass-Steagall Act, Tennessee Valley Authority, unemployment insurance, and more). 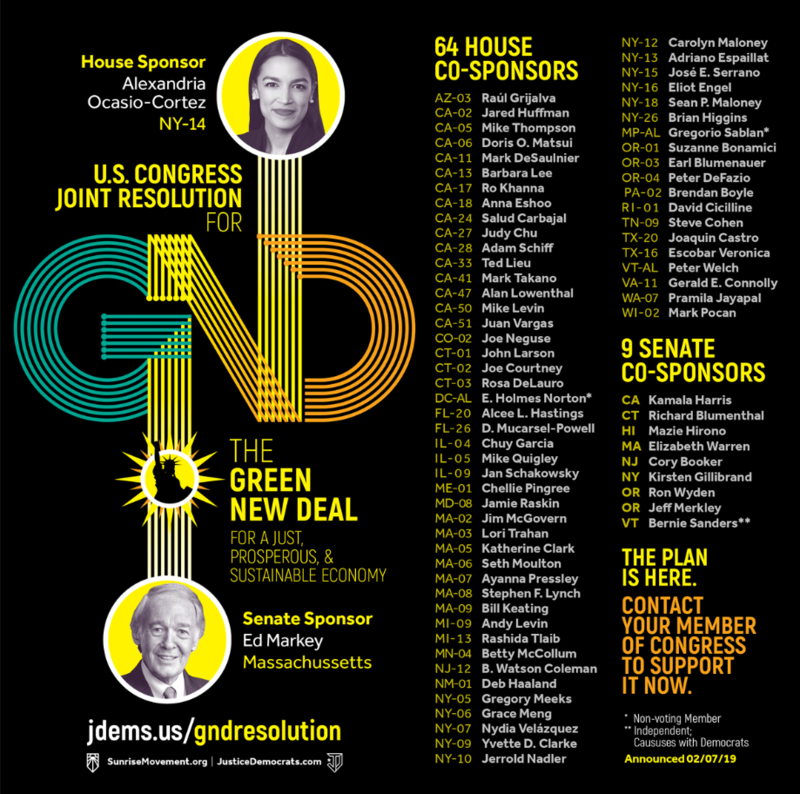 The Green New Deal Resolution outlines a host of current and potential disasters caused by climate change and certain economic policies, and has dire predictions about the health and well being of the planet and nation if the current level of action (or non-action, according to the authors) is maintained. Goals outlined include net-zero greenhouse gas emissions; high wage job creation; infrastructure investment; justice and equality for frontline and vulnerable communities; meeting power demand through clean, renewable energy resources; smart power grids; upgrading all existing buildings to be energy efficient; working with farmers and ranchers for green practices; overhauling transportation systems; strengthening labor and worker rights; and much more. The non-binding joint resolution does not have specific funding, tax breaks, or other information in it. Its purpose seems to be to set the guiding principles of the Green New Deal. Much of the language, and support, has grown out of the Sunrise movement, an environmental movement energized by young activists. The Green New Deal goes far beyond the Clean Power Plan proposed by former President Barack Obama. President Donald Trump has scrapped Obama’s plan, which imposed emissions limits on coal-fired power plants, as a job-killer.